Fire up the grill for your next gathering. 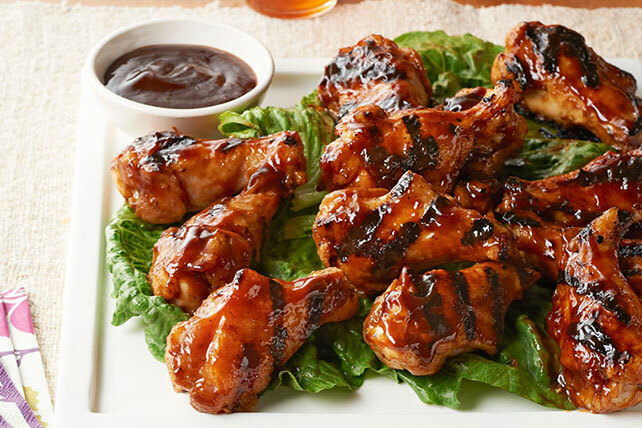 Our grilled chicken drummettes in a ginger-soy barbecue sauce are finger-licking good. Grill chicken 15 to 17 min. or until done, turning occasionally and brushing with barbecue sauce mixture for the last 5 min. If any sauce remains from what is being used to brush onto poultry that is being cooked on the barbecue, always discard it. Then, serve the cooked poultry with additional sauce, if desired, to ensure no bacteria from the raw meat contaminates the cooked meat. Serve as dippers with additional barbecue sauce. Place chicken in 13x9-inch baking dish sprayed with cooking spray. Bake at 350ºF for 40 min. Mix remaining ingredients. Pour over chicken; toss to coat. Bake 10 min. or until chicken is done (170ºF).